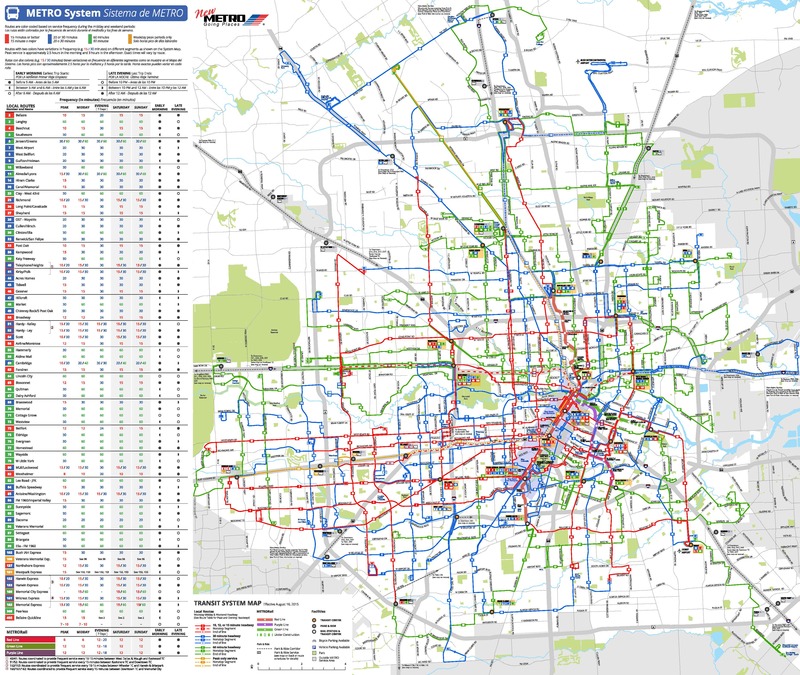 Houston has been in the news recently, and will certainly be today, opening day, for their revised transit system which created a network of high frequency (service every 15 minutes or better, 15 hours a day, 7 days a week) transit lines. The map below left shows this new system, only, and clicking goes to the high resolution image on the Houston METRO website. The map below right shows the entire system, with lines that don’t meet the high frequency definition. The system was redesigned with the help of Jarrett Walker, transit consultant and author of Human Transit, which I posted on yesterday and will be posting a lot more in the near future. So, what’s the story in Sacramento? Sacramento has significant change coming a week from today, on August 24, when the light rail Blue Line opens to Cosumnes River College. Schedules for the light rail and connecting bus lines are being revised in September, and a completely revised route 65 is being established. Sacramento has zero high frequency transit lines, in the Houston definition. There are weekday lines that meet the criteria, but none on weekends. I mapped these few lines, with a 15 minute frequency for 12 or more hours per day on weekdays, in the first map below. The second map below shows the medium frequency lines, which have frequencies lower than 60 minutes, though, again, never on weekends, and my criteria was 11 hours per day, 7:00AM to 6:00PM. The third map below combines the high frequency and medium frequency maps. The last map below is the system map for SacRT, showing all transit routes including ones that are 60 minutes or better, or weekday only, or peak only. This last map is linked to the higher resolution map on the SacRT website. The high and medium frequency maps were hand drawn, and do not accurately reflect the exact route, particularly of the side trips and end loops which were difficult to draw. 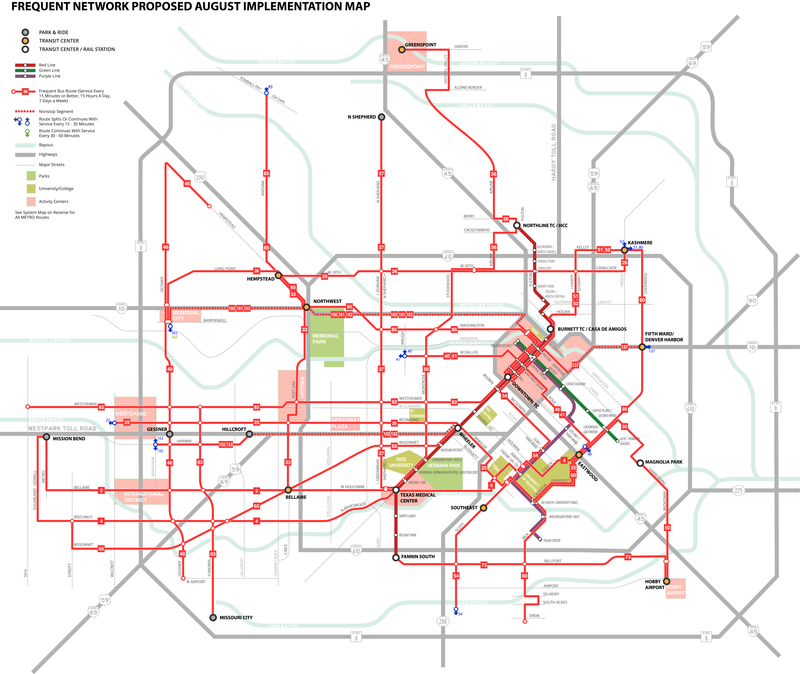 I may at some point obtain real route data from SacRT and revise these maps. SacRT has chosen to run a skeletal system on weekends, and has chosen a network that leans heavily towards coverage rather than frequency. This is a decision spectrum, which I will address in more detail soon, but today seems a good day to get the first post out, in celebration of Houston’s advancement. Yes, Houston is a bigger city (2.2M city and 6.3M region) but was known until recently for its absolute dedication to cars. Things change! Previous Post Beg buttons on K? Really?